Please fill out the form below to have Divine Swine Catering contact you with more info and pricing, or to ask them a question! Since 1982, we have been providing buffet style catered meals to the Twin Cities metro and beyond. We specialize in slow cooked whole roast meats, featuring of course, whole roast pigs. We also offer a full line of hot sides, cold sides, dessert sides and beverages. From casual to formal, small to large groups, our food and service is excellent! 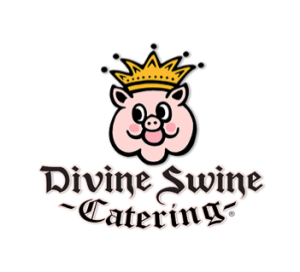 For weddings and other more formal events Divine Swine Catering offers as an option full china, silver, linens, and water service under our Elegant Presentation option- complete with all the needed service. Specialty menus such as Hawaiian Luaus, Mexican, Octoberfest, Irish, Belgian Waffle Breakfast, and Chicken and Rib BBQ are very popular. Vegetarian and other diet specific offerings are provided on a regular basis. We always welcome prospective customers for a free tasting at our facility in Lakeville, MN. Please call to schedule. Please visit our website for menus, pricing, photos and testimonials. We look forward to the opportunity to serve you and would love to cater your event! We had Divine Swine cater our vow renewal and it was perfect. The food was amazing. Scott, our caterer, was on top of everything. Couldn’t have asked for a better experience. Our guests are still talking about it!